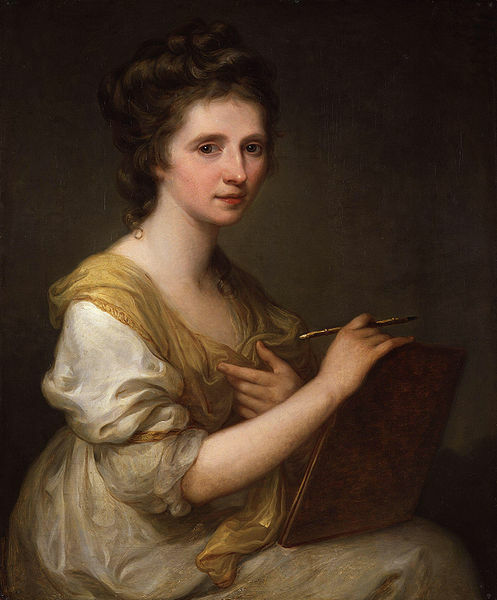 The artist Angelica Kauffman died on November 5th, 1807, aged sixty-six. Anna Maria Angelica Catharina Kauffman was not only a rare example of a highly successful and extremely rich female artist but an adornment of European high society. The only child of an Austrian painter, she grew up in Italy. Her father recognized her precocious talent for drawing and painting, and gave her lessons and by the time she was fourteen she was doing portraits of the Archbishop of Milan and other notables. At twenty-four in 1766 Angelica arrived in London, where she made friends with Joshua Reynolds, who became a key figure in promoting her career. Her father soon joined her in England and she quickly became a fashionable portrait artist. In 1768 she was one of the only two women (the other was Mary Moser) among the thirty-six founder members of the Royal Academy of Arts. Angelica also had a fine singing voice and a talent for music and according to a story that became part of her legend, she had chosen art rather than music for her career on the advice of a Roman Catholic priest. Much later on, in 1791, she did a picture of herself being wooed by rival female figures representing Music and Painting. The latter is pointing sternly to a rocky path up to the Temple of Glory. In real life Angelica was apparently wooed by numerous men. If not considered beautiful, she was extremely attractive, charming and intelligent, was twice married and was credited by the gossips with a good many love affairs. Rumour had it that Joshua Reynolds wanted to marry her, she was passionately pursued by J.H. Fuseli and was allegedly seduced by Jean-Paul Marat, the French Revolutionary who was stabbed by Charlotte Corday to death in the bath. At twenty-six in 1767 at St James’s Church, Piccadilly, she married a conman who called himself Count Frederick de Horn, claimed to be a rich Swedish nobleman and who already had one wife if not more. He was soon demanding money from her father with menaces and after a few months she and her father paid him off and he promised to leave England for good. The scandal did her no harm whatever and later on, after de Horn’s death, in 1781 at the age of thirty-nine she married a Venetian painter, Antonio Pietro Zucchi, long resident in England, who was fifteen years older and a close friend. In a strikingly modern manner she continued to use her maiden name and the marriage contract gave her complete control of her considerable wealth. The fact that she had no children helped her to concentrate on her career. The newlyweds and Angelica’s father, whose health was declining, soon left England for Austria and Venice, where her father died. Angelica and Zucchi settled in a large house in Rome, where Zucchi, who ran the business side of her career, died in 1795. Her cousin Johann came to live with her and run her household while she continued painting, for patrons including Catherine the Great of Russia. She spoke fluent Italian, German, English and French, and her house in Rome was a port of call for artists, writers, art dealers and aristocratic visitors on the grand tour. She became friends with both Goethe and the sculptor Canova. She died in 1807 aged sixty-six; Canova attended her funeral in Rome on November 7th when she was buried beside her husband in the church of San Andrea delle Fratte. A letter describing her death and funeral was read out at a meeting of the Royal Academy in December.